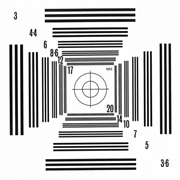 The optical resolution charts are used to test characteristics such as resolution, contrast, distortion and modulation transfer function (MTF) of lenses, cameras and optical systems. 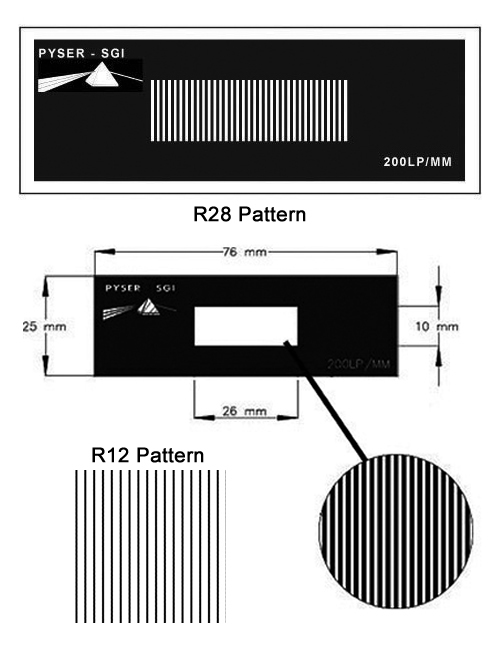 Ronchi rulings and grids are used to create interference patterns, to measure distortion and for MTF measurements. EMS offers a range of charts on glass and in metal foil. Customers often require special charts for specific applications and these can be made to your exact requirements. In addition to these products, we also supply a specialist NPL/HSE test slide for checking the resolving power of phase contrast microscopes – see ref S84 in stage micrometers catalogue. USAF resolution charts are recognized the world over as a universal standard for testing the vertical and horizontal resolution of imaging systems. Each element on the chart comprises three ­­­vertical bars and three horizontal bars, and the detail on these slides is as fine as 0.78microns (644 line-pairs per mm). The resolution of the imaging system is normally specified as the Group and Element of the finest bars that can be clearly defined. USAF Test Chart. positive image. Group -2 to Group 7, element 6. This is a metal foil version of the USAF test chart giving clear, negative type, high contrast patterns in groups -2 to 4. The absence of a glass support substrate removes the problems of masking infrared regions. Foil is double plated to increase rigidity. A series of gratings diminishing in size as they go towards the central target. Lines range from 3 lines per mm to 20 lines per mm. Supplied as a positive high contrast chrome image on glass substrate 50mm x 50mm. Also available in low contrast and negative form. This consists of elements of 5 bars ranging from 1 line per mm to 18 lines per mm, with adjacent numbers indicating the number of lines per mm. Produced as a vacuum deposited chrome image on 75mm x 75mm glass. 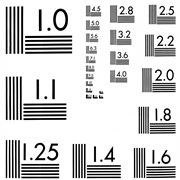 Consists of elements of 5 bars ranging from 1 line per mm to 18 lines per mm, with adjacent numbers indicating the number of lines per mm. Produced as a vacuum deposited chrome image on 75mm x 75mm glass. Metallic grating pattern on glass squares with opaque lines approximately 50% of the pitch. Stock items are on 50mm x 50mm squares of glass 1.5mm thick. The grating covers the entire plate with the exception of R25, R26 and R27 where the grating occupies a 30mm wide central strip. The glass is B270 with refractive index of 1.52. 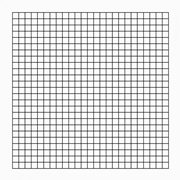 Mutually perpendicular pairs produce a screen of square apertures. Vacuum deposited chrome gratings on glass substrate. 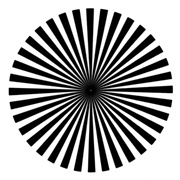 Typically used for testing of resolution, field distortion and parfocal stability, but may be paired to provide interference patterns (fringe patterns) and as light gates.